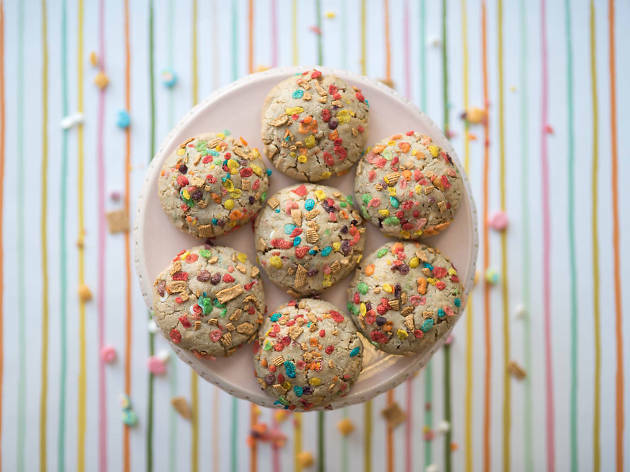 Cookies abound at Milk Jar Cookies, where baking from scratch in small batches is the standard. Favorite standbys (read: the chocolate chip variety) get spiced up alongside seasonal flavors like chocolate-covered banana, birthday cookie or peppermint candy cane. Pair your treat with a glass of milk from Broguiere's Dairy or a cup of joe from Handsome Roasters. Cookies are $3 each—lucky for us, they ship 'em, too. 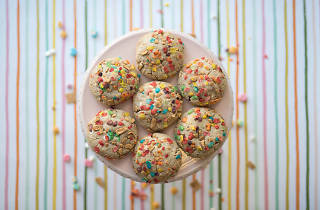 Their classic chocolate chip + their "birthday cookie" are amongst my favorite. Yes, the cookies can be a bit expensive. But they are made from scratch and the perfect amount of chewy - an important attribute. If you have to grab some dessert for a friend's birthday or simply want to bring something delicious to a dinner party, you should absolutely stop by and get a few. You can just feel the love and warmth radiating from the shop when you walk through the door, and that's just the icing on the cake (or cookie). The cookies themselves are so incredible I can't even put them into words. Let's just say Milk Jar Cookies are my go to for any gift giving purposes because I know the recipient will love me forever for introducing them to these cookies. Delicious and huge cookies along with an amazing staff who are always eager to please and friendly as can be! This place is so good. There's no dessert place quite like it in Los Angeles (or anywhere else for that matter)! Should you find yourself in the neighborhood, follow the heavenly scent of cookie baking to Milk Jar. You will not be disappointed. As nostalgic classic baked goods go, I'll take a cookie from them over any cupcake out there. This is my favorite cookie place in LA. I used to work down the street from here in the Miracle Mile area, which was very dangerous. I no longer work close by, but I'll still make the trek for their mint chocolate chip and their banana split cookie. Mmmmmmmmmmmmmmmmmmmmmmmmmm.